Once a patient is identified as being at risk for falls or injury, that risk status must be communicated to all staff, the patient and family members. The current approach is to communicate this risk by documentation in the medical record, report at handoff times like change of shift, and signage either on the patients’ person (bracelet), the patient door, bed and/or the wall. There is a movement amongst states to standardize the colors of different bracelets used in health care systems. In some states an orange bracelet signifies DNR. A color code that is being recommended for universal use includes: white or clear for patient identification; purple for “do not resuscitate;” red for allergies; and yellow for a patient who is a fall risk (Wisconsin Hospital Association, 2007). Research studies on preventing patient falls can include multiple interventions or a study of a single intervention. The following individual interventions have been shown to contribute to fall reduction. Use of a fall assessment tool that has been tested for reliability and validity without any modification done to invalidate the tool. The Morse (2002) and Heinrich (Hunderfund et al., 2011) both are used frequently. Education of patients, family members and staff on fall prevention. Notices in the patient’s room of the patient’s fall risk as well as a yellow bracelet, the color recommended be used for fall risk. Medication review by pharmacists and physicians, certain sleep aides, for example, that may be contributing to fall risk (Beasley et al., 2009). Toileting regimens were found to be effective. According to Tzeng (2010) one community hospital found that 45.2% of all the inpatient falls were associated with toileting. Hitcho, Krauss, Birge, Dunagan, Fischer, Johnson et al (2004) found 50% of the falls in their institution were elimination related. Most of these falls occurred while the patient was on the way to the bathroom from either their bed or a chair. Most studies have found asking ambulatory patients a minimum of every two hours if they need to use the toilet helps reduce falls. In a study by Morse (2002), 14% of all falls in hospitals were accidental. For example, patients may slip, trip, or fall because of equipment failures or because of environmental factors such as wet floors. Standard practices include: adequate lighting, assistive devices, properly fitted shoes and clothing, non skid slippers, personal assistance when needed to enable safe transfers and patient movement, partial side rails, keeping patient rooms and hallways free of clutter, and keeping objects within reach of the patient. 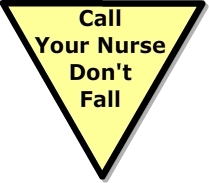 A number of studies have reported more falls occurring on hospital units that had high patient to nurse ratios (Hitcho, Krauss, Birge, Dunagan, Fischer, Johnson et al, 2004; Dunton, N., Gajewski, B, Taunton, R.L., and Moore, J., 2004). There is not consistent evidence in the literature that demonstrates the effectives of bed alarms to reduce falls (Shorr et al., 2010). What has been a general thread is the use of bed alarms with patients who have delirium and cognitive impairment and have issues with mobility. In most cases the patients are not in the hospital long enough for this intervention to be effective. It is recommended that community centers who provide exercise programs for seniors include specific muscle strengthening that could reduce fall risk not only in the hospital but at home also. Studies of patients coming to emergency departments (EDs) because of falls at home are increasingly showing the need for fall prevention programs in the community. Patients fall at home, come to the emergency department and are either admitted to the hospital or sent home again. Within a short period of time, they are again seen in the ED because of a fall. Liu et al. (2015) found one-third of ED fall patients returned to the ED as a revisit or died within a year. Deschodt et al. (2015) found of the 97 patients discharged home from the ED, 18 had an ED readmission in 1 month and 28 patients in 3 months. All authors recommended a complete geriatric assessment before discharge and recommendations for home fall reduction programs. Once a patient is identified as being at risk for falls or injury, that risk status must be communicated to all staff, the patient and family members. Morse, J. M. (2002). Enhancing the safety of hospitalization by reducing patient falls. Am J Infect Control. 30(6), 376-80. Hunderfund, A.N., Sweeney, C.M., Mandrekar, J.N., Johnson, L.M. & Britton, J. (2011). Effect of a multidisciplinary fall risk assessment on falls among neurology inpatients. Mayo Clin Proc. 86(1), 19-24. Beasley, K. (2009). Benefits of implementing an interdisciplinary and multifactorial strategy to falls prevention in a rural, residential aged-care facility. Int J Evid Based Healthcare. 7(3),187-92. Tzeng, H. M. (2010). Understanding the prevalence of inpatient falls associated with toileting in adult acute care settings. J Nurs Care Qual., 25(1), 22-30. Hitcho, E, Krauss, M., Birge, S., Dunagan, W., Fischer, I., Johnson, S. et al. (2004). Characteristics and circumstances of falls in a hospital setting. JGIM: Journal of General Internal Medicine, 19 (7), 732-739. Dunton, N., Gajewski, B, Taunton, R.L., & Moore, J. (2004). Nurse staffing and patient falls on acute care hospital units. Nursing Outlook, 52, 53–9. Shorr, R. I., Chandler, M., Mion, L. C., Waters. T. M., Minshao, L., Daniels, M. J. et al. (2012). Effects of an Intervention to Increase Bed Alarm Use to Prevent Falls in Hospitalized Patients. Ann Intern Med. 157(10), 692–699. Liu, S.W., Obermeyer, Z., Chang, Y., & Shankar, K.N. (2015). Frequency of ED revisits and death among older adults after a fall. Am J Emerg Med. 33(8), 1012-8. Deschodt, M., Devriendt, E., Sabbe, M., Knockaert,D., Deboutte, P., Boonen, S. et al. (2015).Characteristics of older adults admitted to the emergency department (ED) and their risk factors for ED readmission based on comprehensive geriatric assessment: a prospective cohort study. BMC Geriatr.15, 54.